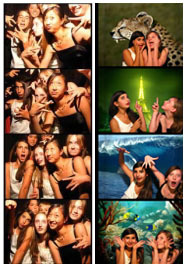 This is a phenomenal hit everywhere we go... Add the fun of a full featured photo booth to your event. This unique booth features customized cutting-edge software to provide the most technologically advanced, customizable photo experience. 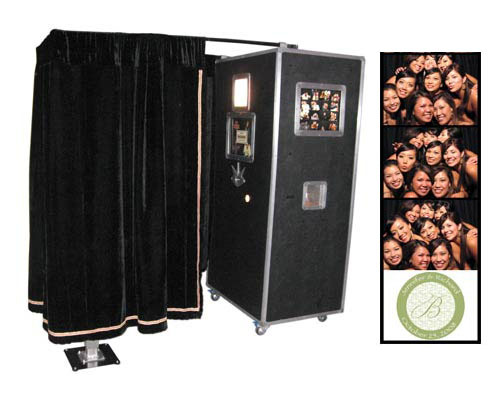 Everyone loves a photo booth and they're great for all gatherings from weddings, bar mitzvahs, graduations, corporate events to private parties. 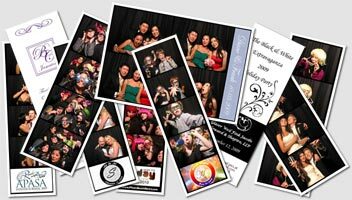 Our photo booths print classic 2" x 6" strips in color or black & white, with your your logo and text on the back. • Free delivery, setup & staffing with a friendly onsite booth technician. We also provide custom one-of-a-kind scrapbooks including multi colored pens, straight and squiggly cut scissors, and double sided tape, double prints of each strip (one for the guest and one for the scrapbook), and the service of setting up and overseeing the station. Missed a Spotlight? View our Spotlight Archive for great ideas.